Hawker Joinery have recently invested in Joinerysoft’s Joinery Management Software (JMS) which provides a total solution from design to delivery for custom timber joinery. Customers of Hawker Joinery should notice a difference immediately with improved customer reports including professional quotes, confirmation of orders, delivery notes and even invoicing. The advantage for customers is that every joinery item is clearly shown with both a true scale drawing and also detailed descriptions listing size, window type, timber species, fittings used, any finishing and even the whole item u-value. Hawker Joinery clients should also notice a considerable improvement in their speed of quoting (If all relevant information is given, we will get a quote to you within 48 hours), and accuracy of pricing, which in turn will benefit their customers too. With JMS it is easy to make job revisions so if the customer decides they want a re-quote in different timber or glazing bar combination this can be achieved quickly and effortlessly providing an enhanced service for the customer. Though the customer will notice the front end design and quoting improvements the software also manages the production process through the automatic production of cutting sheets and material ordering. This will improve efficiency in the workshop, reduce errors in calculations and also improve ordering. Such is the accuracy of JMS that glass can be pre-ordered at the start of the job before the item is manufactured. This reduces production lead times as the glass is ready for installation without delays from waiting to measure the finished item. Joinerysoft’s software also uniquely provides calculation of u-values and full CE marking compliance. Customers of Hawker Joinery will be able to receive u-value certificates and CE marking labels which demonstrate compliance with building regulations. An added benefit is that u-values can be calculated and displayed at the design stage, so customers of Hawker Joinery can be advised how best to meet compliance with building regulations. 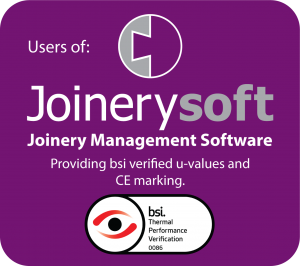 Joinerysoft’s software is verified by the British Standards Institute (bsi) a UK notified body for compliance with CE marking.